I’m really excited to announce the launch of my PledgeMusic campaign for THEO. THEO is my progressive rock project, a musical endeavor I’ve been working on for the last four years. It’s quite different from the type of music I’m known for (ie jazz and blues) but in many ways is a return to my roots. I’ve teamed with PledgeMusic to bring THEO to fruition. And there’s a bunch of cool stuff you can pre-order including a hi-res digital download of the album, CDs, 5.1 surround mixes, t-shirts, keychains, Leslie pedals, and even a Privia PX5s! Check it out and snag your copy today. And when you do, share the page with your friends. Cover art of the new THEO album. I don’t recall how I stumbled upon FabFilter. Most likely I was searching for alternatives to the much pricier Sonnox plug-ins, specifically the Oxford EQ. Somewhere in the mire of forums and blogs I ran across the Pro-Q and decided to try the demo. I remember I bought it almost instantly. The single most important factor in that decision was the beautiful GUI. The idea of combining a spectrum analyzer and an incredibly simple user interface was novel to me. That was in 2012. In the two years since, I’ve also purchased many of FabFilter’s other plug-ins, including the Pro-L, Pro-MB, Pro-C, Pro-DS, Pro-G, Saturn, and Twin 2. I have used them on every project I’ve done since, including organissimo’s Dedicated, Jim Alfredson’s Dirty Fingers, my upcoming progressive rock project THEO, Greg Nagy’s upcoming third album, and various other mixes and songs for other artists. The Pro-C is the first compressor I load for drum parallel compression and bass guitar. The Pro-DS is an amazing de-esser that I use on all vocal tracks. The Pro-G is an amazingly flexible gate that can sound completely natural. I love it on toms. And the Saturn is a great saturation plug-in that I like to use on VST synthesizers, especially analog emulators, to give them more depth, character, and girth. Out of all of them, the plug-in I use the most is the Pro-Q. And I’ve been immensely happy with it. I didn’t think it could be improved but FabFilter managed to do just that in version 2. Dan Worrell’s fantastic video tutorial gives a solid overview of the new features. Spectrum Grab: just grab and adjust a peak in the real-time spectrum analyzer right away! Highly improved CPU optimization: Pro-Q 2 uses less memory and is more than twice as efficient as its predecessor! This is a significant update and well worth the very reasonable upgrade cost. I’ve already upgraded and integrated the new version into my work flow. The new Natural Phase mode is really amazing for adding air to individual tracks or the overall mix. Spectrum Grab is incredibly useful for quick fixes and taming resonances. And the piano roll frequency display saves a lot of time. 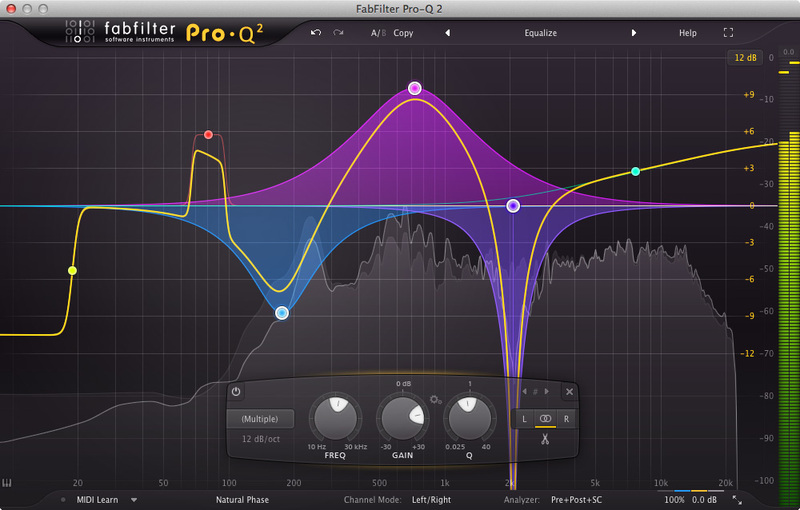 FabFilter still has the best GUI in the business and the easiest user interface. With the added features, it just became more useful and quick. If you’re looking for something better than your DAW’s native EQ, check out the Pro-Q 2. Postscript: I read an interesting article about the differences between digital (aka plug-in) EQs. Essentially once you strip away the analog emulations, there really is no difference. Some plug-in EQs also attempt to emulate the non-linear behavior of analog circuitry including harmonic distortion, noise, etc. And those emulations do vary from plug-in to plug-in. But once removed, the basic sound is the same and even those characteristics can be successfully duplicated with a standard PEQ with a bit of tweaking and good ears and maybe a saturation plug-in inserted before or after. So with that said, why spend money on something like Pro-Q 2? Well, the Natural Phase mode is an analog emulation that does what it is supposed to do very well. But first and foremost, it’s about ease of use. The GUI is so good and the interface so easy to work with that the price is more than reasonable. For most purposes, I can achieve the same results with the built-in track EQ in Cubase but it is nowhere near as intuitive or easy to use, despite the recent addition of a per-track real-time spectrum analyzer.